Sharing a capture of the ANIMATE workspace as I animate the characters in this scene. Notice that each character has their own single Master PEG layer on the main timeline. It took me a while to get my head around what Peg layers are and do because this feature is unique to ToonBoom and doesn't exist in Flash. In Flash, we tend to organize body parts in symbols within symbols within symbols and there is a lot of double-clicking deep into symbols within symbols to do what we need to do. ANIMATE favors organization on parent-child layers that are all visible and accessible on the main timeline. In a nutshell, a Peg layer is like a "controlling layer" under which all the layers of a character are registered. The Peg layer is expandable and collapsible. 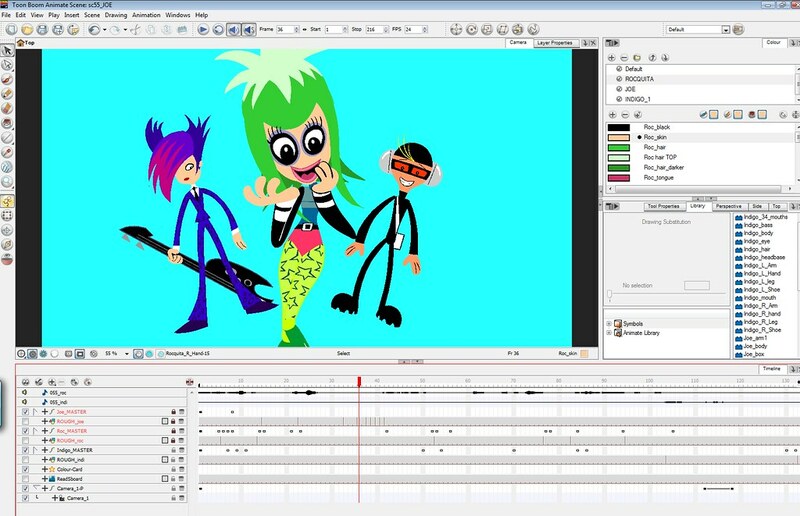 In ANIMATE, Keyframes are represented by black dots on the timeline and these can be Motion Keyframes (tweening, as represented by arrow on the timeline) or Stop Motion Keyframes (no tweening). 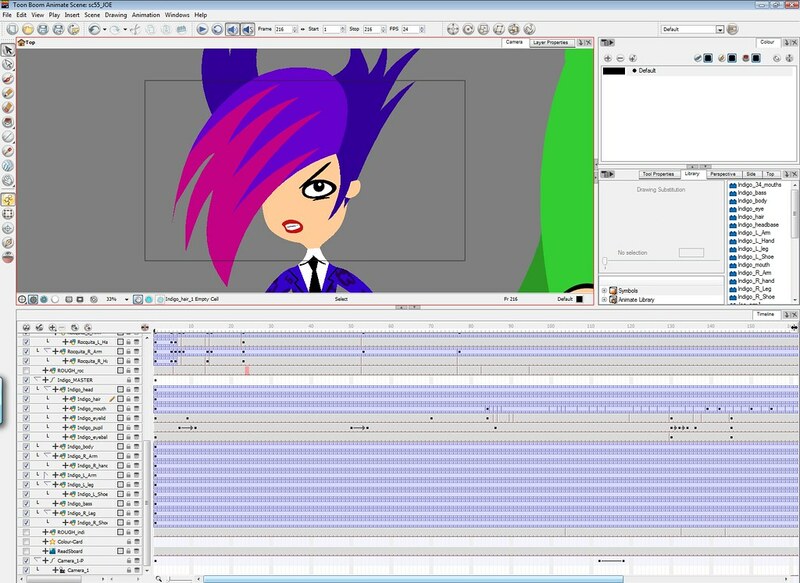 Interesting distinction: In Flash we MUST add a keyframe on the timeline to change a drawing from one frame to the next. In Animate, it depends on how the drawing is being changed. If the drawing is to be repositioned, scaled, rotated etc. from one frame to the next, then we need to insert keyframes. If the drawing is to be replaced by a different drawing or an edited version, there is no need to add a keyframe. We use the "Drawing Substitution Window" OR > "Duplicate Drawings" to create an edited version. In the timeline screengrab above, the vertical lines separating the grey frames show where there are "drawing substitutions". I am still getting used to this concept. *When the "Animate mode" button is enabled , ANIMATE will automatically insert keyframes on the timeline where needed... this is a timesaver!! And the beauty of having a Master Peg layer is that if you move something on one layer, all the other layers remain linked/registered. Tip: If I want to edit a drawing and not be distracted by other drawings/layers or don't want to accidentally select something on another layer, this button above the timeline will hide ALL layers except the one that I am currently working on. We are learning new things each day and as with learning any new program, it will take a little while before we settle on a working system or pipeline that feels right for us. i’d love to see it animated! Thanks for commenting, leBeat! How are your experiences with ToonBoom Animate? Interested to hear about the problems you are having! Having the characters being on Pegs is a bit different than nesting symbols. Currently working on creating some characters inside of Animate and then doing a walk cycle with them -- and this blog is a real big help to me, thanks so much for sharing! everythings seems to be cool ... :-) i like animate! right now i’m animating some characters for a pilot for a weekly series of flashcartoons. hope the client like what he gets, although i don’t like the characters, but its a good practice. i’m used to build my characters in illustrator, the import works well. the inverse kinematic is quite complicated when you cut for example an arm in 20 pieces to animate it like a snake. Hi again, thanks again for sharing your experiences with us. I have just started using Animate and at this point I have been very frustrated with it, why? maybe because things aren't as simple to do as they are in flash, that just raises my anger with Adobe even more for not making the few minor adjustments that we've been asking for years, but that is a different topic all together. It is blogs like this and the money I spent on the program that keeps me motivated in learning it. I have a question that is killing me. When I click on your screen captures of your animate workspace I notice that you have a Master peg with a character and all it's parts in it. Now I know you use drawing substitutions to change the poses, expressions, ect. The question is, do you place all the character's views, ie front, 3/4, rear, side view inside that same Master Peg or do you make different Master Pegs for each view? To answer your question, I put all views inside the one Master Peg when creating turnarounds. I draw the different poses first, then select everything and add the Master Peg afterwards. You can still create drawing substitutions after doing this. Does this help? Yes it does help, thanks Lili. You guys are awesome. I wish I was Eddie and you where my sister, LOL. Thanks again. Thanks for all who are discussing about toon boom animate with this discussing am getting my problem solved, but one thing i have to tell you all that i am not much good at in English speaking.